Sometimes a picture is worth a thousand words. 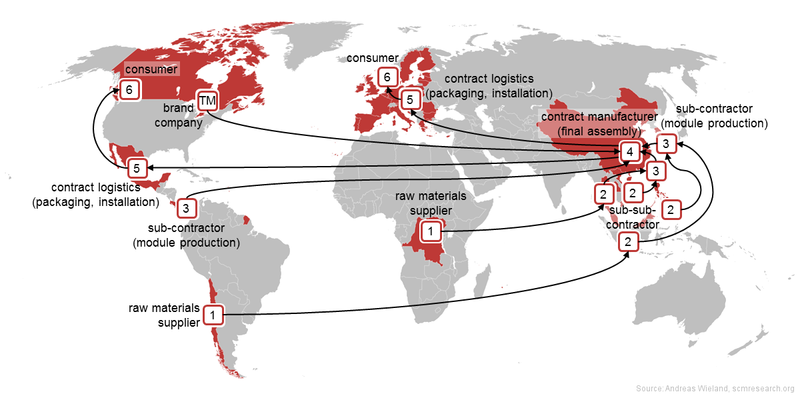 A map of our globe enables us to reflect upon key issues in SCM: Who is actually producing our computers? Where does value creation take place? What are the core competencies of the brand company? Who is governing the computer supply chain? What is the role of contract manufacturers? Why is final assembly being done in China and not in the EU or Canada? Why is packaging being done in Eastern Europe or Mexico and not in China; and why not in Northern Europe or Canada, where the consumers are located? What modes of transport should be used? How long does it take to move a container from Hong Kong to Hamburg? What is the size of a container? What are typical container shipping rates? What can be problematic about sourcing raw materials from the Congo? How would you calculate the CO2 emissions of a computer? How could a linear supply chain become circular? What role will machine learning play? How will the supply chain change in the age of automation? What is the potential role of 3D printing? Is a “supply” chain about “supply” or is “demand” actually the factor that we should be looking? Is a supply “chain” actually a “chain”? Today, I present Mentzer et al.’s (2001) must-read article, Defining Supply Chain Management. The authors demonstrate that, “although definitions of SCM differ across authors […], they can be classified into three categories”: (1) SCM as a management philosophy (= supply chain orientation), which involves a systems approach to viewing the supply chain as a whole, a strategic orientation toward cooperative efforts, and a customer focus; (2) SCM as an implementation of a management philosophy, which involves seven activities such as “mutually sharing information”; and (3) SCM as a set of management processes, which includes processes such as “customer relationship management” and “order fulfillment”. The article also contains a useful definition of SCM as “the systemic, strategic coordination of the traditional business functions and the tactics across these business functions within a particular company and across businesses within the supply chain, for the purposes of improving the long-term performance of the individual companies and the supply chain as a whole”. There has been a recent trend in several management disciplines, including supply chain management, to create knowledge by systematically reviewing available literature. So far, however, our discipline lacked a “gold standard” that guides researchers in this endeavor. The Journal of Supply Chain Management has now published our new article, Durach, Kembro & Wieland (2017): A New Paradigm for Systematic Literature Reviews in Supply Chain Management. Our systematic literature review process follows six steps: (1) develop an initial theoretical framework; (2) develop criteria for determining whether a publication can provide information regarding this framework; (3) identify literature through structured and rigorous searches; (4) conduct theoretically driven selection of literature and a relevance test; (5) develop two data extraction structures, integrate data to refine the theoretical framework, and develop narrative propositions; and (6) explain the refined framework and compare it to the initial assumptions. We believe that these best-practice guidelines, although developed for the SCM discipline, can be used as a blueprint also for adjacent management disciplines. We cannot spare our students the dark secrets of supply chain management. As future decision makers, they need to understand the social and ecological consequences their decisions might have somewhere else on this planet. The chocolate supply chain is a perfect illustration of the complex relationships between consumerism, supply chain management, value creation, and ethical consequences. I have been using this example in my SCM courses for years. So, what is the impact of chocolate? The environmental group Mighty Earth has recently published an investigation into deforestation caused by chocolate: Chocolate’s Dark Secret. Their team visited several protected areas inside Ivory Coast and found that illegal cocoa production has entirely overtaken areas that had been covered by rain forests in the past. Particularly, they found that the world’s largest chocolate companies are connected to cocoa from sources linked to illegal deforestation. The report illustrates how cocoa moves through the supply chain and how value is created in the chocolate industry. There seems to be a lot of confusion about what theory is. At least this is a recurring question I get from students. Let us first discuss what theory is not: Sutton & Staw (1995) show that “references, data, variables, diagrams, and hypotheses are not theory” and they “explain how each of these five elements can be confused with theory” (p. 371). But we should also be aware of the difference between facts and theory! In his essay, which is part of a collection of six essays, Pagell (in: Boer et al., 2015) paints the picture of an ideal research world where “most research will be building or testing facts, not theory”, while “theory building and testing [will be left] to a much smaller group of papers, where the theoretical argument would be critical” (p. 1244). So, what is theory? A definition I like comes from Suddaby (2015): “[T]heory is simply a way of imposing conceptual order on the empirical complexity of the phenomenal world” (p. 1).